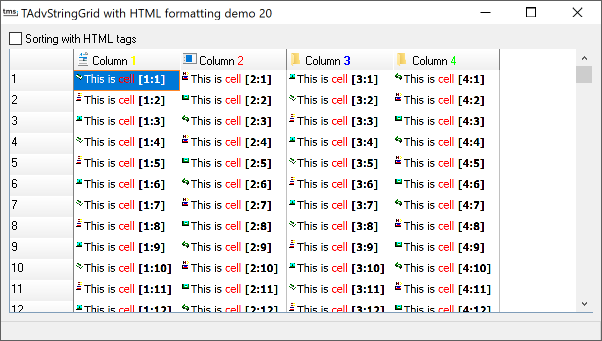 To show the capabilities of the StrippedCells property, which returns the cell string, with all HTML formatting tags removed, a handler has been assign to the MouseMove event, and the cell text is shown in the statusbar. To finish this small example project, the effect of the new ssHTML sorting style is shown. With this style, the sorting is done based on the cell text (with tags removed) whereas in the normal case, string comparing is performed on the full strings including the formatting. The checkbox controls which sorting style is choosen.